Dec 9 2015 (IPS) - Pensionable retirement ages and government pension programs have been established for men and women in countries around the world. Nevertheless, retirement remains an unlikely option for most people. Nearly half – 48 per cent – of all people above pensionable age do not receive a pension, according to the International Labour Organization. And for many who do, the pension levels are inadequate. Consequently, the majority of world’s elderly, especially women who more often work outside the formal labor force, lack income security, have to work as long as they can and in many instances are obliged to rely on family for support and assistance. Old age pensionable retirement is a relatively recent social institution. Throughout most of the past workers by and large continued to work until death or major disability. They were obliged to continue working to due to the absence of pension systems, little accumulated personal savings and low life expectancies. In 1889 Otto von Bismarck introduced the world’s first national pension program for workers, setting the pensionable age at 70, many years beyond the Germany’s life expectancy at birth. In 1935 the United States established its social security program with the normal pensionable age set at 65, or about three years beyond U.S. life expectancy at that time. Today virtually all countries recognize in principle the right to income security in old age, including the right to an adequate social security pension. And nearly all governments have established pensionable retirement ages and pension programs that vary considerably by eligibility, scope, contributions, credits, coverage, benefits, taxes, bonuses, penalties, etc. The current range of normal, pensionable retirement ages worldwide covers a span of 20 years, varying from a low of age 50 to a high of 70 years. Most of the retirement ages, however, are concentrated at 60 and 65, and also 55 for many women (Figure 1). Source: U.S. Social Security Administration. The lowest pensionable retirement ages of 50 and 55 are typically in developing countries with comparatively low life expectancies. In about twenty countries, mostly in sub-Saharan Africa, retirement ages exceed life expectancies at birth. Also in high mortality countries, such as Angola, Chad, and Nigeria, the chances of a 15-year old dying before reaching age 60 are about 1in 3. And in some extreme cases, such as Lesotho and Swaziland, more than half of 15-year olds are not expected to survive to age 60. The highest pensionable retirement ages of 65 or older are in wealthy developed countries with high life expectancies at birth. In many instances, life expectancies at birth in developed countries are more than ten years greater than the retirement ages. The chances of a 15-year old not reaching age 60 in the low-mortality countries, such as Italy, Japan and Sweden, are comparatively low, about 1 in 20. In addition, average life expectancy at age 65 among the more developed countries is 17 years for men and 21 years for women. Due to their lower mortality rates, women typically live longer than men. 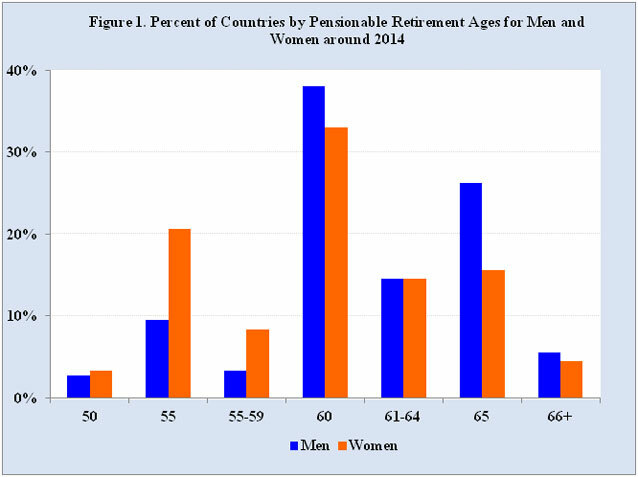 However, in no country are pensionable retirement ages higher for women than for men. In about two-thirds of the countries or roughly half the world’s population, including Australia, Canada, Egypt, France, Germany, India, Indonesia, Japan, Mexico and United States, women and men have the same retirement ages. In contrast, one-quarter of the countries, including Argentina, Austria, Brazil, Chile, China, Iran, Israel, Pakistan, Poland, Russia and Saudi Arabia, have set women’s retirement age five years less than men’s. In the remaining countries, which include Bangladesh, Czech Republic, Italy, Switzerland, Turkey and United Kingdom, women’s retirement ages are one to four years less than men’s. A possible explanation for lower pensionable retirement ages of women is to permit couples to retire at approximately the same time given that women are usually younger than their spouses. However, women’s lower retirement ages are not advantageous in terms of pension benefits, especially as many women have work histories interrupted by childbearing and family responsibilities and consequently accumulate fewer pension-contributing years than men. In countries providing general social security pensions for their elderly, government budgets have remained largely in the black during past decades. This is primarily due to favorable population age structures, which provided many pension-contributing people in the working ages and relatively few elderly persons drawing benefits. For instance, whereas developed countries in the mid-20th century had more than eight people in the working ages (15 to 64) for each elderly person (aged 65 and older), the current ratio is slightly less than four. By the year 2050 the ratio for the developed countries is projected to fall to two working age people per elderly person. With the changing demographics, notably fewer workers per elderly person and increasing longevity, many governments are concerned that red ink budgets for the elderly are arriving in the near term. Avoiding the red ink threat to the sustainability of retirement systems poses major social, economic and political challenges, especially for many of the oldest countries, such as Greece, Italy, Japan and Spain. A general aim of governments is to control the growing expenditures for the elderly. More than half of all countries and most developed countries have adopted changes during the past five years to increase the pensionable retirement age or reform pension systems, including reducing retiree benefits, increasing contribution levels and rates, encouraging work beyond normal retirement age, and linking retirement ages to life expectancies. Continuing to increase retirement ages would certainly reduce governmental pension expenditures for the elderly. Among the OECD countries, for example, retirement ages have increased by several years, with 67 becoming the new 65 in many countries. Some countries are also considering moving towards a retirement age of 70, including the Czech Republic, Denmark, Ireland, Italy and the United Kingdom. However, such increases in pensionable retirement ages are generally not sufficient in themselves to offset the effects of population ageing and increasing longevity. In order to maintain today’s ratios of workers to the elderly, retirement ages would need to be raised by more than just a few years, which would be very difficult politically. An important consequence of recent pension reforms has been transferring more of the costs directly to the elderly. Unfortunately, most of the world’s elderly and near elderly do not have sufficient financial resources in savings, investments or private pension schemes that would permit them to retire adequately. Over the past century noteworthy progress has been made globally in establishing pensionable retirement ages and tax-financed pension programs for the elderly. However, for most of world’s population these pension programs are either unavailable or insufficient to meet their needs in old age.